Brandon McVittie is a graduate of Art History from Montreal's McGill University where he studied traditional studio methods, materials and approaches in painting. His art pieces include oil paintings, historical style, allegory, portraits, figure paintings. Visit Wall Space Gallery in Ottawa today. 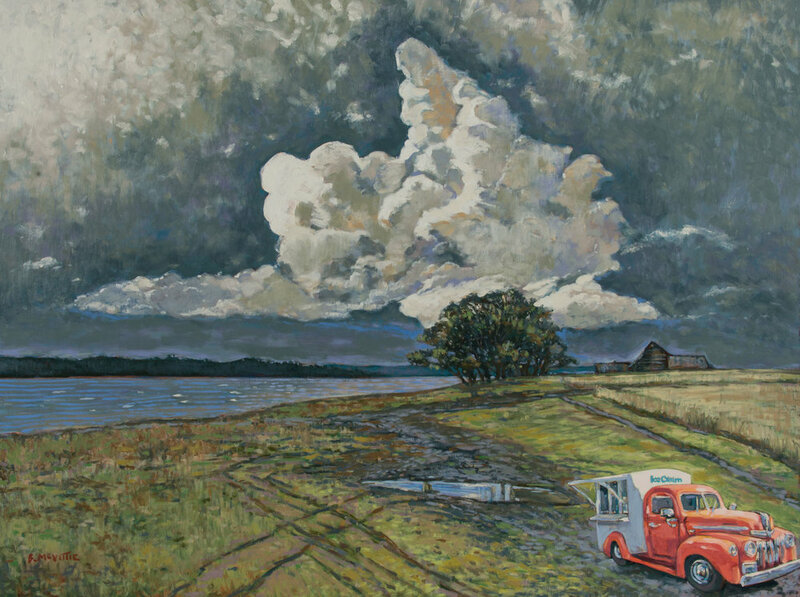 We Had Seasons in the Sun, oil on panel, 48 x 36"
McVittie has worked as an historical illustrator for Canadian Geographic Magazine and has illustrated for court rooms and national newspapers, magazines and television, including: the Ottawa Citizen, the Toronto Star, the Vancouver Sun and both the CTV and CBC television networks. As past co-owner and curator of ARTGUISE Fine Art Gallery in Ottawa from 1996 to 2010, McVittie helped launch careers of emerging artists and drew international attention presenting exhibitions for over a decade. He is widely recognized for his landscape oil paintings that emulate an old world flavour in execution and palette. In his genre pieces, he explores mid 20th century inspirations while paying homage to the rendering style(s) of figures made fashionable by artists/illustrators from the era. He strives to incorporate his nostalgia for vintage sentiment in his painting, conveying the old as new again. Visit Brandon McVittie's website here.